Turmeric has long been used as both a spice and a medicine. The University of Maryland Medical Center states that turmeric has been used for over 4,000 years in both Ayurvedic medicine and traditional Chinese medicine to treat inflammation throughout your body, digestive conditions, and soft tissue injuries. The most powerful active ingredient in turmeric is a substance called curcumin, which is a potent antioxidant. Before using turmeric for medicinal purposes, consult your doctor about dosage and treatment duration. Turmeric, notes MedlinePlus, is the principle spice in curry and possesses a warm, yet bitter, taste, and that the root of the turmeric plant contains medicinal ingredients and is used in herbal preparations. The turmeric plant, which grows in tropical forests of certain parts of Asia, is one of the principle ingredients in Thai, Indian and Indonesian cooking. 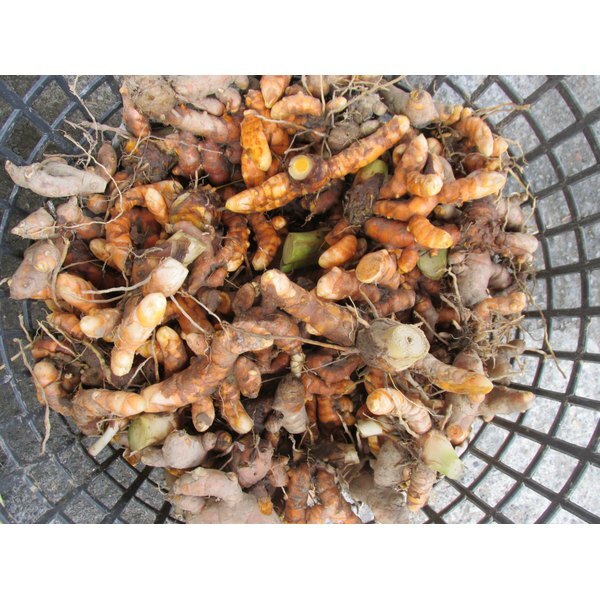 Although the root is the most commonly used part of the turmeric plant, the leaves may also be used for culinary purposes. Turmeric is endowed with numerous health actions. In his book, "Therapeutic Herb Manual," herb expert Ed Smith notes that turmeric is well-known for its anti-inflammatory and antioxidant actions. This botanical medicine is also used to protect your liver from toxins, decrease your platelet stickiness and prevent injurious blood clots, and reduce cholesterol levels in both your liver and your blood. Turmeric is considered a depurative, or a substance that removes pathogens or contaminants from your body. Turmeric is used to treat a wide spectrum of health conditions. Turmeric is used to halt the proliferation of quickly dividing cancer cells in your body, treat inflammatory skin conditions such as psoriasis and eczema and rid your body of intestinal gas. Other conditions that may benefit from turmeric include contusions and other soft tissue injuries, colic, asthma, certain types of arthritis, infections and fever. Turmeric helps fight free radical damage and helps improve your circulation, notes Phyllis Balch, author of "Prescription for Nutritional Healing." Turmeric, though usually safe and effective, should be used medicinally only under the guidance of a knowledgeable health care practitioner. A botanically trained health care professional can tell you if this herb is right for you and how it should be used to achieve optimal health benefits. In some people, turmeric may cause gastrointestinal upset and is not recommended for people with certain health problems. Ask your health care provider about reputable companies offering turmeric herbal supplements.